I am a Fine Art Artist in Drawing and Painting. I also have a passion for Natural Lifestyle Photography. Teaching is yet another passion and I instruct students in all three areas of self expression from my personal studio here in the Arizona desert. I founded "Elbow Canyon Fine Art Workshop Retreats" many years ago. 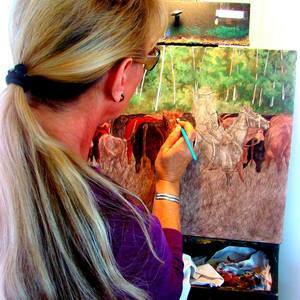 I offer 3 and 4 day retreats of "one on one" instruction in painting, drawing and natural life style photography. You will see a selection of my fine art here at Saatchi, you can view my entire body of work at www.redbubble.com/people/susanbergstrom. Thanks for viewing my work. Displaying 12 pieces of my Fine Art Drawings and Paintings at the Mesquite, Nevada Branch of Bank Of Nevada. This is an ongoing exhibit.